Soups are great all year round. They are very comforting, nourishing and You don’t need to be a good cook to whip up a tasty soup. Whenever we think of soups, we tend to think of a hearty bowl of warm soup. I love my warm soups, but I also love chilled soups. These chilled soups are flavourful, light, refreshing and the best part is, you don’t need to cook them! they are very easy and quick to make. The varieties are endless. You can mix and match any of your favourite vegetables of your choice. So I’m going to share with you 4 of my favourite chilled soups. Each recipe makes 4 servings. These recipes can be easily modified to suit your diet, whether you’re a vegan or vegetarian. Because they’re chilled, I like to make them ahead, have them for breakfast or you can take it to work or school for lunch! Let’s start by making the chilled mint cucumber yoghurt soup. In a blender, I’m going to add 4 cups of chopped up cucumber, ½ cup of fresh mint leaves, 1 garlic clove, minced, 1 ½ cup of yoghurt for the creamy texture, 2 tbsps. of freshly squeezed lemon juice, don’t forget to add in some healthy fats, so about 2 tbsps. of extra virgin olive oil, salt & pepper to taste and finally about ½ cup of cold water. Let’s blend it up! Serve immediately or chill in the fridge for at least 2 hours or overnight. 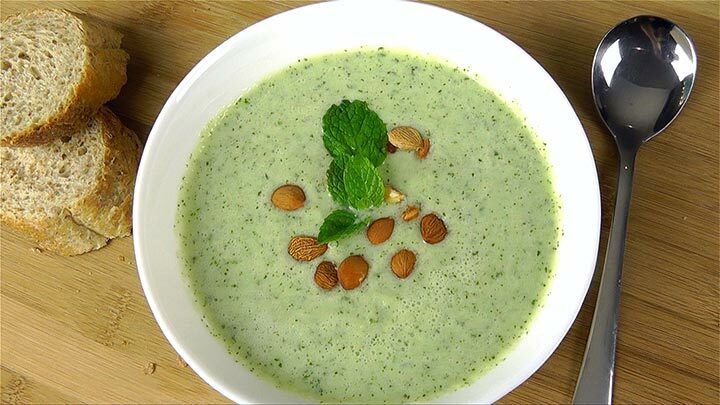 This bowl of chilled mint cucumber soup is creamy and makes a refreshing starter or side dish. Each serving has about 113.5 calories. I’ve topped it with some chopped up cucumber, tomatoes, onion and olives. This soup goes really well with grilled chicken, cous cous, rice or even naan. The next soup recipe has a delicious nutty flavor, chilled Chickpeas Sesame soup. In a blender, I’m going to add 2 cans of chickpeas, rinsed and drained. 1 garlic clove, minced, 2 tbsps. of sesame seeds, ¼ tsp. ground cumin just for the extra flavor, 3 tbsps. of freshly squeezed lemon juice, 2 tbsps. 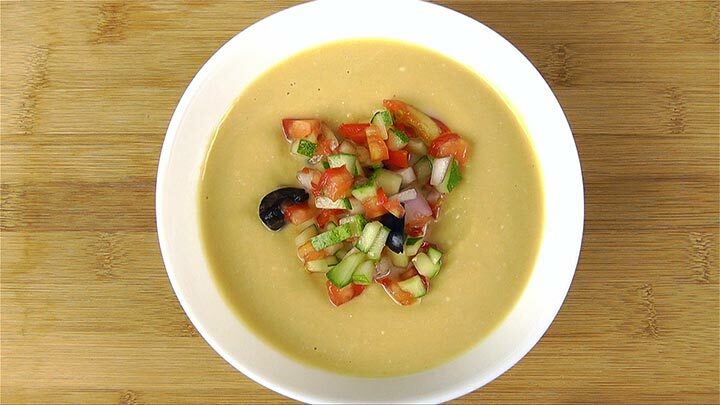 extra virgin olive oil, salt & pepper to taste and 1 ½ to 2 cups of water, depending on how thick you like your soup. Let’s blend it up! If you like the crunchy texture of chickpeas, then blend it very quickly or you can blend it until the mixture is smooth. Let’s pour it and chill in the fridge! This is my favourite soup to have for breakfast. It’s extremely filling, very easy to digest and I’m getting all the nutrients from one bowl. I’m getting my protein and fibre from the chickpeas, healthy fat from the olive oil, and mineral and vitamins such as magnesium, calcium and iron from the sesame seeds. Each serving has about 238.5 calories. It’s basically a perfect bowl of goodness to start your morning or it can also be a light lunch served with bread or even salad. *more if you like the taste of it. 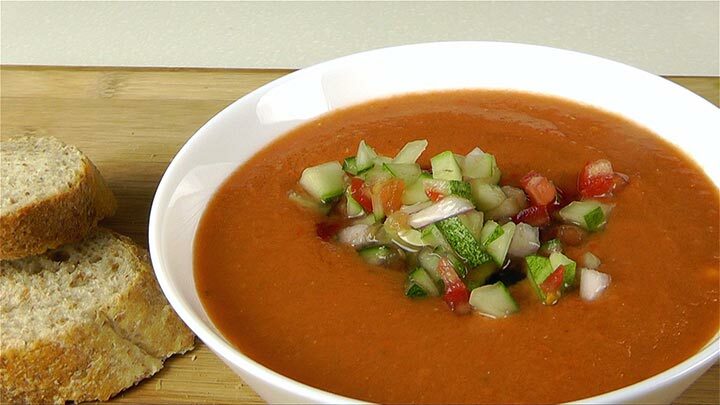 If you enjoy your spice, then you’ll love the chilled spiced tomato soup. In a blender, I’m going to add 3 cups of chopped up tomatoes, ¼ cup of diced cucumber, ¼ cup of diced red onion, ¼ cup of diced red bell pepper, 1 garlic clove, minced, about 2 tbsps of balsamic vinegar, 2 tbsps. of extra virgin olive oil, 1 tsp. of cayenne pepper for the kick, ½ tsp. of cumin, salt and pepper to taste and just about 1 cup of cold water. Let’s blend it up! Pour it and chill in the fridge. I love the spiciness, sharpness and intense flavor of this soup. It wakes the palette up. Each serving only has 73 calories. It’s great as a light starter, which also fills you up and help you eat less during your main meal. 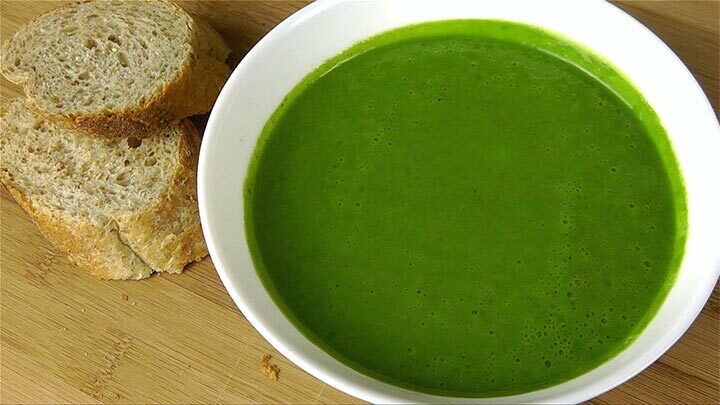 And finally, let’s make this green bowl of chilled avocado spinach soup. In a blender, I’m going to add about 4 cups of fresh baby spinach, 1 ripe avocado, peeled and diced, 2 tbsps. of fresh basil, 1 garlic clove, minced, ¼ cup yoghurt, 2 tbsps. freshly squeezed lemon juice, 1 tsp. smoked paprika, salt and pepper to taste and 1 – 2 cups of cold water. I like to call this super soup. It’s powered up with spinach, avocado and fresh herbs. If you don’t like to eat your vegetables, this is a great way to add more greens into your diet. It has a unique, fresh flavor that’s very satisfying and healthy. Each serving only has 83 calories + all the green goodness. If you’ve never had chilled soups before, give these recipes a try. They’re so flavourful, convenient and I just love how they can be eaten right from the fridge. Make them ahead and they will keep well for up to 3 days. • Creaminess – Try adding almonds, silken tofu, or plain yogurt to the puree. Alternatively, use regular/vegan milk, or buttermilk, to add a richness to it. • Thickness – Bread crumbs, nuts, and dried fruits (including sun-dried tomato) can help to thicken a very thin soup. • Brightness (read: acidity) – Add fresh citrus juice or a dash of vinegar for a better, more complex flavor. • Richness – Don’t be afraid to add fats, from a drizzle of avocado oil to a cupful of olive oil. (Although go slowly and taste as you add, as you can’t undo it.) Avoid coconut oil, which will harden if cold. • A kick – Cayenne, minced jalapeños, garlic cloves, chili oil, harissa, sriracha, Tabasco, and paprika are all good options. • Texture – Don’t puree all of what you’ve got. Save half a vegetable and add it in at the end, pureeing just until it remains chunky, or serve with chopped hard-boiled egg, or pieces of crispy prosciutto, or more toasted nuts. Or croutons. Or grated cheese. Or fresh corn kernels.